Peter Hoskin and Éoin Clarke were knocking lumps out of each other last week about whether debt and debt repayments were worse under John Major than they are now. At least they were knocking lumps out of each other with numbers and bar charts. This exchange represents one of the more civilised discussions on the subject. On some of the political blogs the same argument has descended into vitriol and infantile name-calling of the worst kind. They’re both sorta kinda right and both sorta kinda wrong. Firstly, was the debt Gordon’s fault? Well even Peter Hoskin’s own chart would seem to suggest not. We’ve had high debt and high debt repayments before. In a recession, the state gets a triple whammy. Tax receipts drop as fewer businesses and employees are paying tax. Then welfare payments go up so more has to be borrowed to make up the shortfall. Finally GDP goes down so the number you are dividing the borrowing by reduces. The effect is to make the deficit-to GDP and debt-to GDP ratios shoot up. When the economy starts to grow again, the reverse happens. The GDP goes up, the tax receipts go up and the welfare bill goes down. The deficit reduces and, if you’re really lucky, you can start paying off some of the debt. Even if you can’t, the debt-to-GDP ratio goes down anyway just because you’re dividing it by a bigger number. 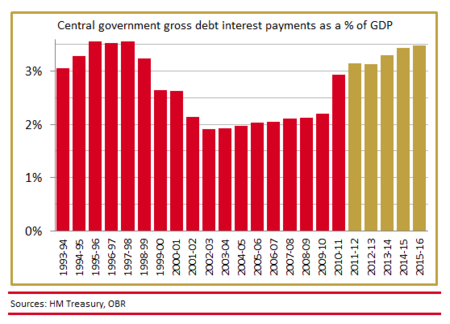 Although Gordon Brown increased public spending from the early 2000s, the impact on the public debt was fairly small. The deficit reached a peak in 2005 and was on the way down, only to shoot up again in 2008 when the recession hit – as it always does when recessions hit. OK, if Brown had not increased spending by quite so much the debt would not be quite so huge but it would still be huge. We’ve just been through the worst financial crisis since the 1930s. It would be a miracle if the debt wasn’t huge. Furthermore, something similar happened in the other developed economies. The recession left them all with rocketing deficits. If it’s a Brown Debt, therefore, it must also be a Merkel Debt a Sarkozy Debt and a Bush Debt. So if it’s not all Gordon’s fault, then, what about the other part of the left-wing argument – that the debt is no worse than we’ve had in the recent past? If you look at the figures for the last half-century, that’s true too. We are just creeping above the debt levels of the early 90s and, even with the projected rise over the next few years, it will still be lower than it was in the 1960s when we were still paying for two ruinous world wars and the Great Depression. So does that mean there’s nothing to worry about and we will get out of debt again just like we did in the past? I’m afraid not. 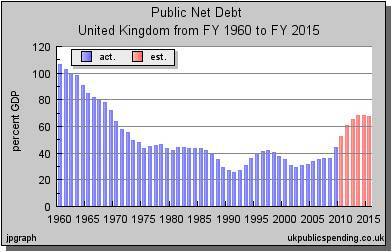 We were able to pay down our debts during the 1960s because of high GDP growth which produced high tax revenues. It was the same in the 1980s and in the mid-to-late 1990s. Just as debt goes up rapidly in recessions, high growth brings it down again. The trouble is, in the forseeable future, we are unlikely to see the storming levels of growth which paid off our debts so quickly in the past. The graph below is based on data from UK Public Spending and projections in the IFS Green Budget, which predicts that growth will bump along at around 2 percent for the next five years. One of the consequences of the great rebalancing is that much of the economic growth will take place elsewhere in the world. The G7 economies are, it seems, destined to be 2 percent growthers for some time yet. But wait; there’s more. Just as we are struggling to pay off our debt with low levels of growth, the demands on the state are increasing rapidly due to demographics. 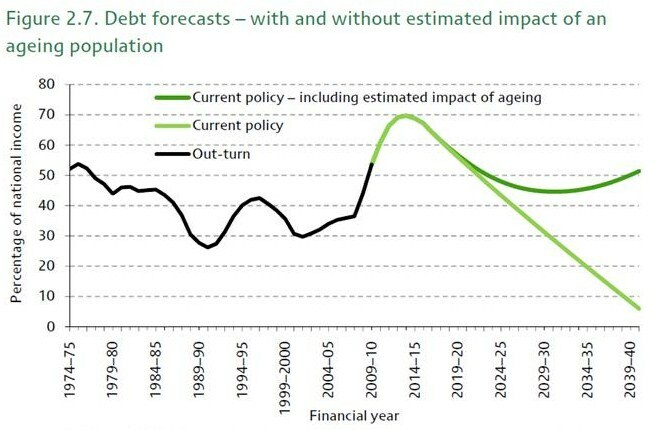 This graph, probably the scariest of scary IFS graphs (again from the Green Budget), illustrates the problem starkly. Even without the impact of an aging population, it will be well into the 2020s before the debt reaches pre-recession levels. Add in the demographic factors and, without further spending cuts or tax increases, it never will. This suggests that, without further spending cuts or tax rises over and above those already announced, the ageing population will lead to increased spending and hence borrowing and this will be sufficient to prevent public sector net debt from falling back to below pre-crisis levels. Therefore, the government will need to consider the extent to which it is prepared to tolerate a future path for debt that is above that which existed before the financial crisis, and how this compares with its willingness to announce further tax rises and spending cuts in order to limit this situation. Which is similar to the conclusion reached by NIESR and the 2020 Trust. So there you have it. No, the massive public debt wasn’t all Gordon’s fault, though he could have done more to ensure it wasn’t quite so big. Yes, we have had larger debts than this before but this time it’s going to take a lot longer to pay it all off. And, I’m afraid, yes we do need spending cuts and there will have to be more of them and/or significant tax rises by the early part of the next decade. None of this is to say we need to cut quite so fast and quite so soon. At the moment, it probably makes sense to hang fire for a couple of years. But over the longer term, if public finances are to be restored, the cost of delivering public services will need to come down. That will be the challenge of the next decade. This entry was posted in Peak State, Public Finances. Bookmark the permalink. This is a great Post Steven. Well researched and more importantly well balanced! And it serves as a wake up call and cautionary note to all my recruitment friends out there and those that are talking about job growth. If the GDP projections graph is correct (and personally i think that even a 2% GDP growth over the next 5 years might be generous) there will be NO growth in recruitment/jobs. 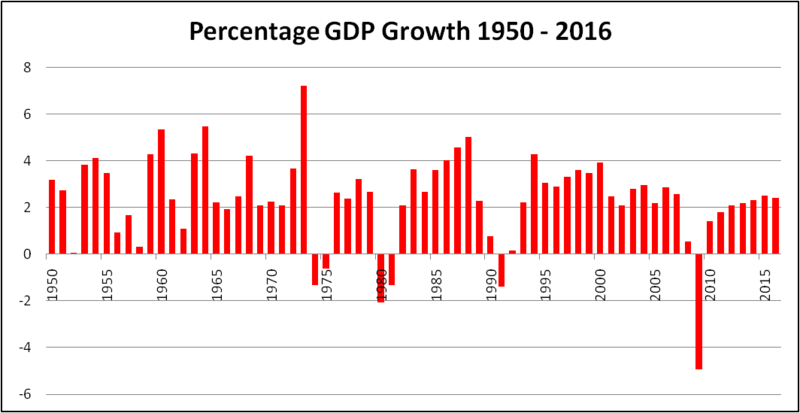 The jobs market, and therefore recruitment only grows when GDP hits 2.5% and above. Worth remembering when we are talking about ‘growth’ in recruitment. Martin, I didn’t have space to go into this but it will be the subject of a future post. The bailout accounts for a relatively small portion of the debt, although it was a sizable chunk of the deficit increase in 2009. The state is also getting cash back from the bailout because all those toxic assets we bought or guaranteed are still paying out and the level of default has been nowhere near as bad as we thought. That offsets the amount we have to pay back on the loan. The debt is primarily due to recession – even those countries with smaller banking sectors suffered and have rising debts. No state can stand such a collapse in tax revenue. That said, the antics of the bankers made the recession much worse than it would otherwise have been (and there was always going to be one eventually) so they are still on the hook for a lot of the blame IMHO! Very stylish and well put together. It is rare to come across such well presented work. And as you rightly say it is pretty balanced. As a Keynesian, I am going to be blind to the alternatives, I admit that. I venture to say the same for those on the other end of the political spectrum. So, for those two reasons, I will mostly leave the entire piece unchallenged. I look forward to reading more. Very good post that proves that my getting annoyed at the Tories bleating about how it was all Labour’s fault is indeed being economical with the truth. Also, the knee jerk reaction to have top pay off this debt like some kind of final credit card demand is beyond me too. The casualties, i.e. half a million people set to lose their jobs in the public sector, will do nothing to stimulate the economy as that, along with a general tightening of the belts by the public in general means that money isn’t being spent on our high streets.And, with hardly no manufacturing industry base to speak of, it al looks like too much too soon in terms of the Conservative solution. 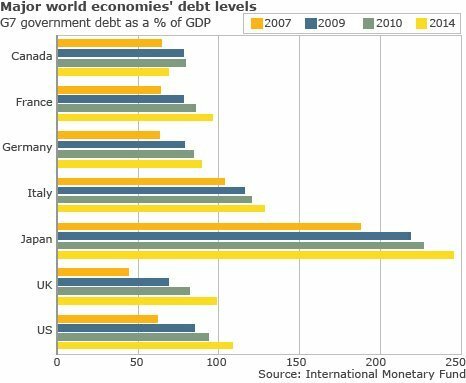 What works most though is that out of the likes of the US, Japan, Germany, France and Italy the UK has the lowest debt as a percentage of GDP yet we don’t hear of the same level of austerity measures being introduced elsewhere. I meant to say ‘irks’, not ‘works’! An excellent article, however, one item you have overlooked is bond yields. The main reason for the pace of cuts was to ensure that the cost of borrowing remained manageable. Ultimately this is a political decision as it aimed at influencing the ratings agencies and bond markets, but if you look at the yeild on gilts, you must conclude that the market is supportive of deeper cuts. Thanks Kieron. I’m not convinced about the ratings agencies because we’ve had so many mixed mesages from them. They, too, have warned that we might damage growth and thus our ability to pay off the debt by cutting too soon. The reason they gave for threatening our AAA rating in the last year of the Labour government wasn’t so much the size of the debt as the lack of a credible plan for doing anything about it. Any long-term deficit reduction plan would have calmed things down. It didn’t need to be quite as rapid as this. Historic bond yield comparisons should also be taken into account. Just because things look OK with yields the way they are now, doesn’t mean things will always be that rosy. A prudent analysis would allow for long term bond yield to rise by at least a few % points. If The UK were having to pay 5-6% on its debt for example the figures would look a lot more alarming. Your analysis is akin to someone taking on a large interest only mortgage, and saying ‘Don’t worry I can afford the repayments easily’ when rates are low. Not only does one need to be able to pay the interest in rockier times, but have some idea how to pay off the principal as well, which of course the current generation is leaving its children to do. Here you are kids, enjoy this! Bring on the stats! Well done, mate. Can you explain – with stats preferably – why you think it might be better to hang fire on the cuts (not as far as deep). I don’t have a view on either way, but would be good to get some kind of opinion on it. You were getting a bit closer with the ‘Peak State’ entry… GDP as any kind of meaningful measure is a complete crock. So a lot of people aren’t going to be able to redeem their coupons. I agree with the fist half of your article highlighting the fact that our debt as a percentage of GDP is less than for most of the last century, and less than many other “advanced” countries. I am less convinced by the second half. I am no economist (!) but it seems to me to be based on the assumption of making huge cutbacks. I start from the perspective outlined in the Green New Deal programme proposed by a range of economists and politicians such as Larry Elliot, Caroline Lucas, Ann Pettifor etc that proposed the opposite: namely a massive programme of Green Public Works to stimulate the economy, provide jobs & reduce unemployment, and tackle the problem that is even greater than the economic crisis – climate change. Why have you not considered such a radically different programme and approach ? Davy – I think public works to tackle climate change is an excellent idea and I think that it would help to kick start the economy. In the short-term I agree that the state needs to keep spending. But is that a viable long-term strategy? Would it not just rack up an ever-increasing debt pile as the IFS predicts. Ultimately, would the massive extra spending you advocate it deliver enough growth over a short enough timescale to outrun the increasing debt? I’d love to believe it would be possible but…..